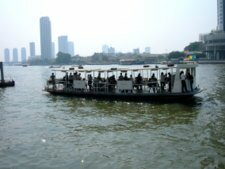 The Chao Phraya River tourist boat takes visitors on a cruise circuit of eight piers for a sightseeing tour of the historical sites in old Bangkok along the Chao Phraya River. Here are the piers you’ll be visiting, what you can expect to see along the way and the historical significance of these places. 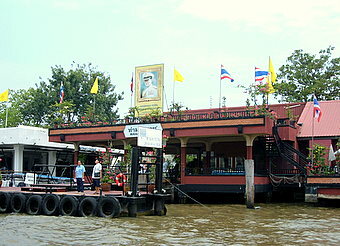 Please note that the Chao Phraya River tourist boat doesn't stop at N 6 Memorial Bridge pier (Saphan Phut pier) anymore. Start your tour from the Sathorn just below the Bangkok skytrain station at Taksin Bridge. 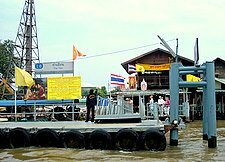 The pier and the road leading up to it, was named after Luang Sathon Rachayutt, a title awarded to a Chinese immigrant who built Sathorn Road and Sathorn canal in 1892. The impact of this road and the canal on the area is recorded in hotels in Sathorn. N 1 Oriental is near the Oriental Hotel which had its origins in 1865 and made famous by writers like Joseph Conrad, Somerset Maugham, John Le Carre, James Michener and Ian Fleming. After the Oriental Hotel, the Chao Phraya River tourist boat takes you past three very old buildings on the Bangkok bank of the Chao Phraya River which is on your right as you are going upriver. 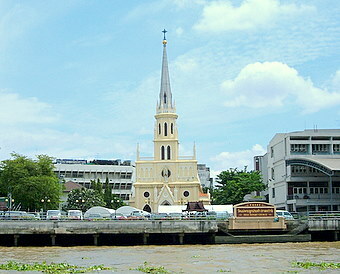 The Holy Rosary Church near Chinatown was built by the Portuguese in 1786 from a land grant by King Rama I. 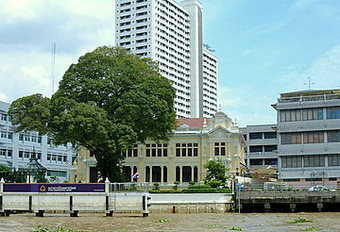 In 1906, Siam Commercial Bank the first Thai bank was established. This building, the Talad Noi branch, was designed by Italian architect Annibale Rigotti. The Portuguese were the first Europeans in Thailand way back in the 16th century. 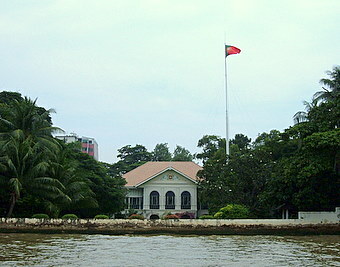 Their embassy, the oldest in Bangkok, is just by the Chao Phraya River before the Si Phraya pier. Four Phrayas or Four Noblemen was a name given by King Rama V to the road leading up to the next pier, N 3 Si Phraya. 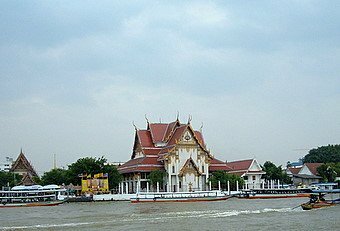 Phraya is a noble title just below Chao Phraya. Charoen Krung Road the oldest road in Bangkok built in 1861, is a short walk from the pier. At N 5 Ratchawongse you can get to Yaowarat, Chinatown Bangkok started in 1782 when King Rama I established the capital in Bangkok. 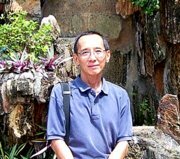 The Chinese community, who were living in what is now the site of the Grand Palace, was granted land here and started Yaowarat. 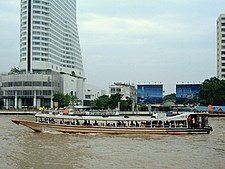 The Chao Phraya River tourist boat used to stop at the N 6 Memorial Bridge Pier or Phra Buddha Yodfa, the official name in Thai which is also the formal title of King Rama I. 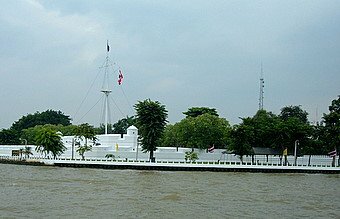 The locals call the pier Saphan Phut and it’s located near the Memorial Bridge, the first bridge over the Chao Phraya River built in 1932. The other Chao Phraya bridge next to it is the Phra Pok Klao Bridge. If you wish to visit these places by boat, you'll have to take the non-express boat (no flag) or the express boat (orange flag). Please see Chao Phraya River river boats for these boat services. 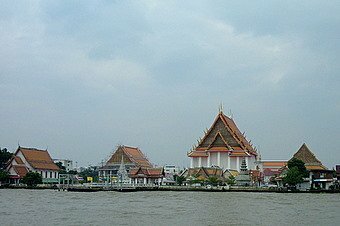 From here on, focus your attention on the Thonburi bank of the Chao Phraya River, on your left as you are going upriver. This is Thonburi, the previous capital before Bangkok, with King Taksin as the only king in that era. The dome of the Santa Cruz Church rises above the roofs of the old river communities. This old church was built by the Portuguese in 1770 during the reign of King Taksin. Beside the Santa Cruz Church is Wat Kanlayanamit, a relatively new temple built in the reign of King Rama III (1824 – 1851). 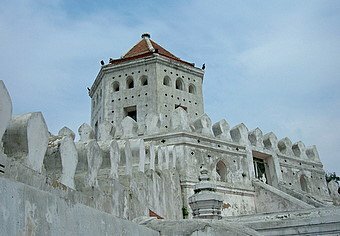 Next the white walls of Fort Vichai Prasit, an old Ayutthaya fort built in 1688, come into view. King Taksin’s palace was within this complex. The entire area is now part of the Royal Thai Navy HQ. From here on you’ll encounter two very old temples from the Ayutthaya days. 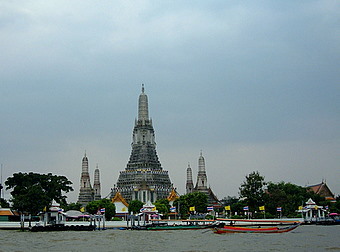 First there’s Wat Arun the famous Temple of Dawn built in the reign of King Narai in the mid 17th century. This is followed by Wat Rakhang another old Ayutthaya temple. Wat Rakhang is not well known to foreign visitors but extremely popular with the Thais. Wat Arun and Wat Rakhang are among the nine temples that Thais visit to make merit on auspicious occasions. Wat Rakhang (bell) got it’s name from an ancient bell unearthed during construction. 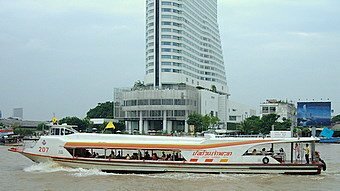 The Chao Phraya River tourist boat will then berth at N 8 Tien which leads to Wat Pho the Temple of the Reclining Buddha, an old Ayutthaya temple. This temple and Wat Mahathat further upriver flank the Grand Palace. From Maharaj Pier, a tourist pier, you can visit Wat Mahathat, another Ayutthaya temple, the Grand Palace and Temple of the Emerald Buddha, the old city, Rattanakosin. N 10 Wang Lang (Siriraj) is on the Thonburi bank near the Siriraj Hospital, the first public hospital built in 1888 by King Rama V. The hospital was named after one of his sons who died at a very young age. The Siriraj Medical Museums are located within the hospital. At N 13 Phra Arthit (Banglampu) the Chao Phraya River tourist boat turns around in the circuit. You can get off here and walk around Fort Phra Sumen nearby, an old Bangkok fort built in 1783 in the reign of King Rama I, one of the two remaining forts of that era. 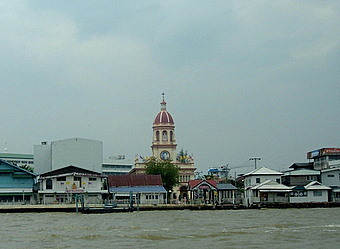 The Rama VIII Bridge, the most prominent Chao Phraya bridge along the route, is further upriver. The Chao Phraya River tourist boat operates everyday from 0930 – 1600 hours, departing every 30 minutes from Sathorn. A day river pass for 150 baht for adults and 80 baht for children below 100 cm in height allows unlimited trips for the day. This excludes admissions fees to the various places visited. These changes take effect from August 2011. You can also choose to buy single trip tickets from the Sathorn Pier to any of the other designated piers. If you have problems with the names, just use the alpha-numeric codes for the piers. Tickets are sold at Sathorn, Maharaj, Phra Arthit piers and the BTS (Bangkok Transit System) Tourist Information Centers at Siam, Nana and Taksin Bridge BTS Stations. You'll be given a leaflet showing the Chao Phraya River tourist boat schedule. Please take note of these timings if you don't want to miss the last boat. However if you do, all's not lost. There are still take the regular Chao Phraya River boat available every 20 minutes till 1840 hours. Don't miss this one. Enjoy your Chao Phraya River tourist boat cruise. To return to Bangkok river cruise.